A man accused of using the identities of his mom and dad to run up more than $3 million in debt admitted all 48 felony counts in court yesterday. He could get up to 41 years in prison, according to plea deal paperwork. Tyler Adams, now 40, was acting as his own attorney yesterday when he signed the deal, in San Diego’s North County Superior Courthouse. Adams has been in custody for three years, and his case was set for trial this week. Prosecutor Anna Winn said she has been adding more charges, since Adams was first arrested in 2009. “He’s given me more time to work on it,” the deputy district attorney said. Trial has been delayed partly because Adams has acted as his own attorney, on and off, over the years. Adams reportedly used the identities of his elderly parents to buy properties in Rancho Santa Fe and La Jolla and downtown San Diego – while the retired couple lived modestly in a double-wide mobile home in Pennsylvania. Adams grew up on the East Coast with the name Kevin Michael Schoolcraft, he moved to California when he was in his twenties. He changed his name when he moved West. Adams bought a tract home in Temecula, and told people that he worked in real estate. In 2006, Tyler Adams talked his stepfather into letting him “borrow” his good credit rating, so Adams could buy acreage in San Diego’s North County, according to testimony. The stepfather said that was when all the trouble started; he testified in court more than a year ago. It was six years ago when Adams reportedly told his stepfather, Donald Chaffee, that he had plenty of money, plenty of cash, but he needed his stepfather’s good credit to close a real estate deal. “He’s always trying to make deals,” remembered Donald Chaffee. The older man was surprised and flattered to find out that he had “a good credit rating,” he said he was not aware of this, and had never checked on such a thing. And then Tyler Adams said he needed power of attorney too, and a social security number, to make the big real estate deal happen. “And I provided all that,” admitted Donald Chaffee. The agreeable stepdad mailed a notarized power of attorney from Pennsylvania to Tyler Adams in January 2006. Prosecutor Winn said the prodigal stepson purchased multiple properties using the identity of both parents, and collected more than $180,000 just in commissions because he posed as both loan officer and real estate agent. Tyler Adams never made any payments, and defaulted on at least five mortgages, Winn alleged. Adams collected rent from tenants at some of the properties and pocketed that money, according to the prosecutor. Adams also opened up credit lines to buy clothing and computers and to charge common living expenses such as groceries and gasoline, it is alleged. Investigators in San Diego County got an arrest warrant for Tyler Adams in July 2009. After months searching, they caught him moving his belongings out of a property in La Jolla, and took him into custody November 2009. Sentencing is set for November 15 before Superior Court Judge Robert Kearney, who took Adams’ guilty plea with “no deals from district attorney’s office, no deals from the court,” according to the paperwork. Tyler Adams in a San Diego courtroom more than a year ago. Photo Weatherston. Prosecutor with stepdad Donald Chaffee in the witness box. Photo Weatherston. 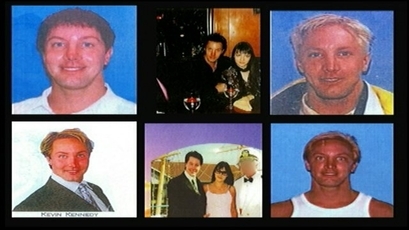 Various photos of Tyler Adams released by authorities while he was a fugitive. SurfPuppy619 Oct. 18, 2012 @ 3:50 p.m. I remember this case-the step-father had a terrible time getting the power of attorney revoked. Guy is a nut-I predict a long term. Ponderer Oct. 27, 2012 @ 10:56 p.m. I have been following this story in The Reader and it seems to me that the Dad was in on the whole thing. I can't believe he could have allowed his son to use his identity and buy all those properties for two years, without knowing what was going on and being in on it. As far as Tyler Adams' pleading guilty to 48 charges I don't understand that at all either. Why would anyone do that, especially with “no deals from district attorney’s office, no deals from the court?" If he had gone to trial he could not have been convicted of more than those 48 counts. Wasn't he charged with 48 counts total? SurfPuppy619 Oct. 28, 2012 @ 12:55 a.m. The dad was definitely not a part of the scam, no way. girlduck26 Nov. 20, 2012 @ 11:35 a.m. Nope.....I truly believe the Dad was NOT part of it. Tyler can be snobby and probably thought he had the right to do whatever he wanted. This is sad.... it was like he wanted to live like a movie star and thought everything should come to him fast. No patience.